"Glee Gum is all-natural, gluten-free chewing gum with no artificial coloring, flavoring, sweeteners nor preservatives. Glee Gum is the only gum in North America made the old-fashioned way, with chicle! Chicle is a natural tree sap harvested sustainably from the rainforests of Central America. Once all chewing gum was made with chicle, but today most gum is made entirely from synthetic stuff. Not Glee Gum! Glee Gum uses chicle because it is an eco-friendly way to help conserve the rainforest. Chicle is also what gives the gum such great, long-lasting chewing texture! Glee Gum is a “green” gum right down to the packaging, which is made from biodegradable, recycled cardboard. So chew with Glee, naturally!" 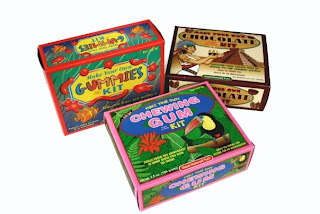 "Available in Make Your Own Chocolate, Make Your Own Chewing Gum, and Make Your Own Gummies, these activity kits are all-natural, educational, and eco-friendly. With pre-packaged ingredients and easy-to-follow instructions, everyone aged 8 and up gets a real kick out of making candy from scratch. Focusing on the history behind and the origin of these candies, each kit is designed to captivate your interest, connect you to the global community, and create something yummy to eat in the process!" ABCD Diaries gives Glee Make Your Own Gummies Kit an A for ages 8 and up...we think it would be especially cool for birthday parties or sleepovers:) Thanks to Glee for letting us review this awesome kit! And now for the giveaway...Glee has offered one lucky ABCD Diaries reader the candy making kit of their choice! To enter leave a comment below telling us which candy making kit you would choose. Then do as many of the extra entries as you'd like(be sure to leave a comment for each one:). Disclosure: ABCD Diaries was given a Glee Make Your Own Gummies Kit for review purposes only. We were in no other way compensated. The opinions expressed in this post are ours and ours alone. "Make prehistoric times come to life with extraordinary dinosaurs that once roamed the earth! Cut-and-color or pre-colored action figures really move as you bring Tyrannosaurus Rex, Allosaurus, Triceratops, Stegasaurus, Ankylosaurus, Brachiosaurus and others to life. Move their jaws, clash their teeth, and make their powerful legs run as you act out your own dinosaur battles-or make up your own stories about these mighty creatures that ruled the planet. Use this creative learning tool to introduce and reinforce the wonder of natural history and inspire a love of paleontology with hands-on activities for children ages 6-12." Dinosaurs on the Move, by Cathy Diez-Luckie, was a super fun book for us to review. 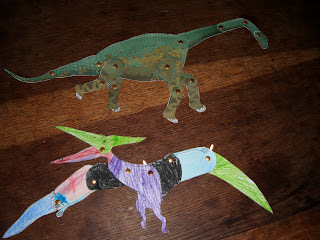 A loved coloring the dinosaurs and expressed some serious creativity(she said if people weren't around then how do we know what color the dinos were...great question, and maybe they were pink and purple:) D loved chasing A's pteranodon with the pre-colored brachiosaurus we put together, and amazingly the wood-free card stock held up to his rough toddler play. A lot of help was required for my little ones to do this project, but they are a little younger than the recommended age of 6-12. The dinosaurs from this book proved to be great for expressive play and A was especially interested in reading the dino fact cards for each one. She loved finding the places on the map where the remains have been found. ABCD Diaries gives Dinosaurs on the Move an A+ for ages 6 and up. Thanks to KSB Promotions and Cathy Diez-Luckie for letting us review this awesome book! 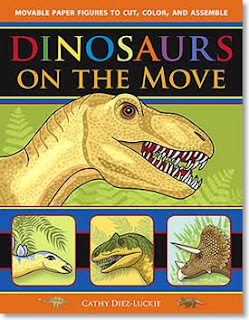 Disclosure: ABCD Diaries was given a copy of Dinosaurs on the Move for review purposes only. We were in no other way compensated. The opinions expressed in this post are ours and ours alone. "In 1968 Country Bob perfected the sauce of his dreams. After years of giving the sauce to friends and family, he began to sell it in 1977. The reaction was overwhelming just as it is today. Almost everyone who tries Country Bob's All-Purpose Sauce becomes a lifelong user. And why not, it is the perfect complement to practically any meal set on your table." B has always said asking for steak sauce for your meat is a "diss" to the chef, because it covers the flavors of a well-cooked dish. I, on the other hand, would prefer to dip as much of my meal as possible and I have passed this preference on to both A and D. So naturally, most of us were super excited for the opportunity to try Country Bob's All-Purpose Sauce. The first meal we made after getting our sauce in the mail was hamburgers, so I went to the Country Bob's website to find a was to incorporate the sauce into the meal and oh my! The recipe section of the site is RIDICULOUS! There were so many to chose from, I could hardly believe it! I mean I guess it is ALL-purpose sauce, but geesh! So of course, there was hamburger recipe...actually labeled "World's Greatest Hamburgers"...I mean, who could resist trying that one? I have tried "mixing" stuff in with my hamburger patties before and it has almost always ended in disaster, but this recipe was amazingly easy to throw together and the meat actually held its shape very nicely. The flavor was a little sweet for our tastes(we're from Texas and we like it spicy:), but these burgers reminded me of restaurant style burgers and were pretty delicious. Of course I couldn't resist using it straight up as a dipping sauce, so a few nights after the burgers, the menu was Steak and Chicken on the grill and I finally got to dip my meat:) Again, absolutely yummy. I think our next recipe will be for the finishing sauce, or maybe the grilled onions, or maybe...well I could go on and on with the extensive recipes list:) We will definitely be trying the Country Bob's Spicy and oh man, I can hardly wait! ABCD Diaries gives Country Bob's All-Purpose Sauce an A for the whole family:) Thanks to Country Bob's for giving us the chance to test out your delicious sauce. Country Bob's is generously offering 2 ABCD Diaries readers a two-pack of their amazing All-Purpose Sauce. To enter leave a comment below telling us how you would like to try your Country Bob's sauce first. Then do as many of the extra entries as you'd like(be sure to leave a comment for each one:). 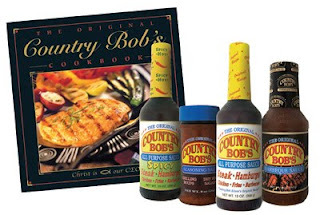 Disclosure: ABCD Diaries was given 2 bottles of Country Bob's All-Purpose Sauce for review purposes only. We were in no other way compensated. The opinions expressed in this post are ours and ours alone. 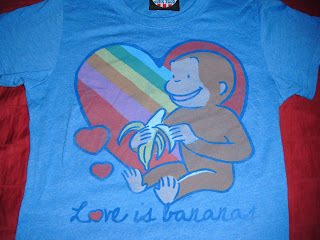 My Curious George tee above is absolutely wonderful! It is made from super soft cotton, so it is crazy comfy and has very slimming girl fit which is always nice:) The kids LOVE it too...I wore it to story time at the library and was the center of attention. I really like the bright colors and retro design. Crazy Dog T-Shirts has something for everyone. From vintage, to movie and TV, to holiday, to just plain offensive, I would be surprised if you couldn't find one(or one hundred:) you love. Crazy Dog T-Shirts let you make a statement and are definitely eye-catching ice breakers. And to top it all off, Crazy Dog T-Shirts are crazy affordable! The have a $6.99 daily t-shirt special, $6 mystery tees, and right now they have a ginormous clearance section of awesome shirts. These would make great gifts for anyone in your life so check them out! ABCD Diaries gives Crazy Dog T-Shirts an A+ for the whole family, because guess what? They have kid's tees AND dog gear! So there you have everyone in the family covered! 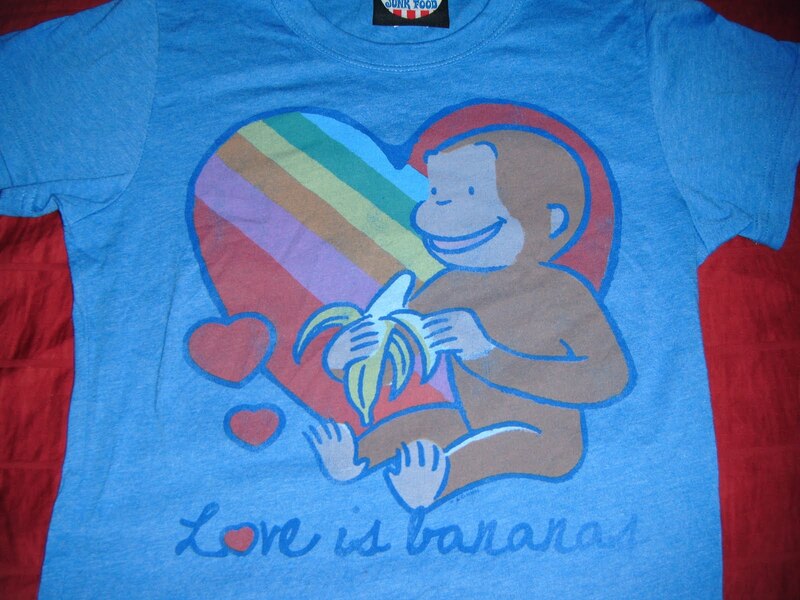 Thanks Crazy Dog for letting us review you awesome tees! And now for the giveaway! 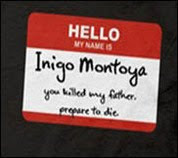 Crazy Dog T-Shirts has generously offered one ABCD Diaries reader the tee of their choice!! To enter, please leave a comment below, then do as many of the extra entries as you'd like! -Enter any other ongoing giveaways on ABCD Diaries and leave a comment for each one entered. Giveaway is open to US only, 18+. Ends Thursday, May 27, 2010 at midnight(central) Winner will be chosen by random.org and contacted by email and announced here and has 72 to reply. Good Luck to everyone and thanks for reading The ABCD Diaries!! Disclosure: ABCD Diaries was given a t-shirt for review purposes only. We were not otherwise compensated. All opinions expressed in this post are ours and ours alone. 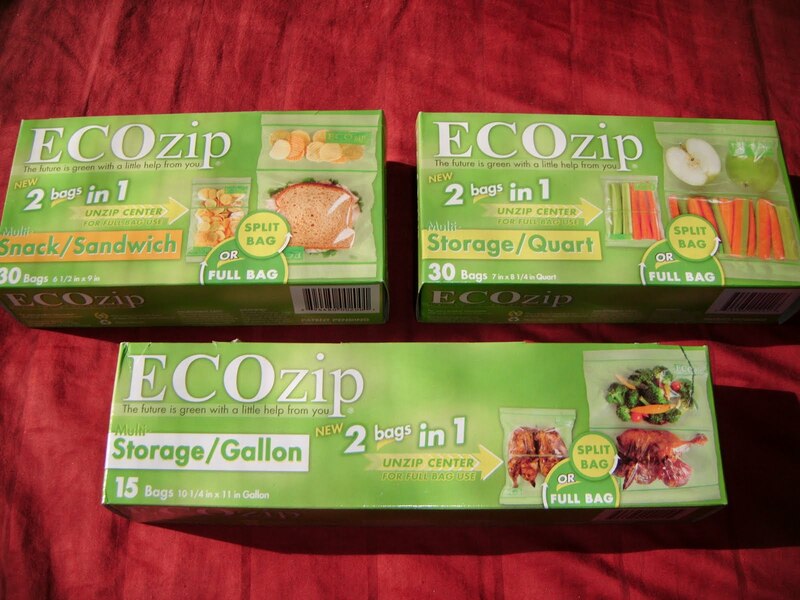 "ECOzip is a simple storage solution that saves time, money, space and ultimately the environment. 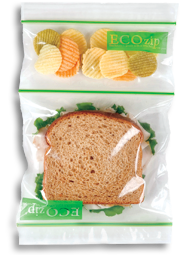 By creating 2 bags in 1 technology, ECOzip enables you to store 2 types of items in one bag. This in turn reduces the amount of plastic bags needed for a single lunch or other sets of items you carry. And the fewer plastic bags we use, the less burden our plastic production and disposal places on the environment." 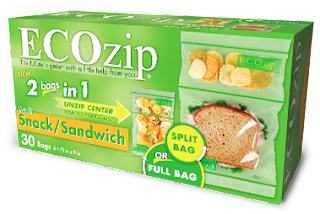 ABCD Diaries gives ECOzip bags an A+ for the whole family:) Thanks to ECOzip for letting us try out this innovative product! -separating cut from whole...onions, celery, shredded cheese/block, shredded or chopped carrots/sticks, etc. And now for the giveaway...ECOzip is sending one lucky ABCD Diaries reader a set of 3 boxes of bags, one of each size!! -Facebook fan ECOzip and help them spread the word! Giveaway ends Monday, May 24, 2010. Winner will be chosen with random.org and emailed...you have 72 hours to reply. Good Luck!! Disclosure:ABCD Diaries was provided with a set of ECOzip bags for review purposes...we were in no other way compensated and the opinions expressed in this post are ours and ours alone. Congrats to Trudy and Hannah C! You have been emailed and have 72 hours to get back to me:) Thanks to everyone who entered...Stay tuned for some more awesome giveaways this week!! Before reading I Am Hutterite, written by Mary-Ann Kirkby, I had never heard of the Hutterite religion or culture. Since reading it, I feel as if I have actually been inside one of the Hutterite colonies. Kirkby exhibits an extraordinary ability to draw the reader so fully into her writing, you feel as if you've been right by her side the whole time. She transports you to another place and time and even after tearing yourself away from this intriguing page-turner, bits and pieces of the story stay with you. You really come to know and love(or not:)her colorful characters. You sympathize with them. I especially loved Kirkby's authentic use of the Hutterite language. She so seamlessly translates for her reader's benefit and it really helps include everyone. Not being familiar with the Hutterite culture, it was easy for me to feel like I was reading fiction, but knowing it was truly Mary-Ann Kirkby's life made reading this book quite an eye-opening experience. I Am Hutterite brings up issues of prejudice, faith, acceptance, healing and the importance of fulfilling one's destiny. It is an amazing story of seeking your own truth and living your own best life no matter what trials and tribulations you are faced with. I applaud Mary-Ann Kirkby for a job well done and congratulate her on her healing journey. Thanks to Book Sneeze for providing ABCD Diaries with a review copy of I Am Hutterite. We were not otherwise compensated. The opinions expressed in this post are mine and mine alone. ABCD Diaries gives SKOY cloths an A+ for the whole family:) Thanks SKOY for letting us review these amazing cloths! And now for the super exciting part...The GIVEAWAY!!! SKOY has generously offered 4-packs of SKOY cloths for 2 lucky ABCD Diaries readers. To enter, just leave a comment below. For an extra entry you can sign up to follow ABCD Diaries via Google Friend Connect. Giveaway ends Friday, May 14th at noon. This contest is open to 18+ and USA only. The winners will be chosen with random.org and contacted via email, as well as posted here. Winners have 72 to respond or another will be chosen. FTC Disclaimer: ABCD Diaries was given a sample set of SKOY cloths for review purposes. We were not otherwise compensated. All opinions in this post are ours and ours alone. The Yoplait Greek Spa Gift Pack giveaway ends tomorrow(Friday, 5/7) at noon. Click here and leave a comment if you'd like to enter for your chance to win! Thank you Golden Moon Tea for letting us review your amazing tea! Become a Facebook fan of Golden Moon Tea for updates on these delicious teas! FTC Disclaimer: ABCD Diaries was given a sample of Golden Moon Tea in exchange for this review. We were not otherwise compensated. All opinions expressed in the post are ours and ours alone. Chippy Chipmunk Parties in the Garden tells the story of a chipmunk, aptly named Chippy, as he discovers the joys and dangers of the author's gorgeous backyard and all of the plants and wildlife within. Kathy M. Miller took a series of pictures over the span of 2 years of Chippy's adventures. She is a fabulous nature photographer and this book is beautifully photographed from start to finish. Chippy Chipmunk is engaging for young and old alike. The amazing pictures kept A, who is almost 4, intrigued throughout the entire book. She really loved the interesting chipmunk facts in the back and even I learned a thing or two:) A liked the book so much, she asked if Daddy could read it to her when he got home on the day we got it and we've read it over and over again since then. The ABCD Diaries gives Chippy Chipmunk Parties in the Garden an A+ for ages 3 and up. Thanks to Kate at KSB Promotions and author Kathy M. Miller for the opportunity to review this wonderful book! Disclosure: Chippy Chipmunk Parties in the Garden was provided to ABCD Diaries free of charge in exchange for our review. The opinions in this post are our own.